Although it has an awful smell, but there are lots of health benefits of eating garlic, and including it in your diet would be a wise choice. So many people lay emphasis on the smell, due to the fact that it is quite irritating to many, but if we should lay that aside we will discover that there is a lot of benefits we can derive from consuming this fruit. Therefore it should be of importance if we are including garlic into our diet. The garlic, Allium sativum as it is scientifically called has been entitled as the world healthiest food. There is a quote that states that "if garlic does not have its smell, it will surely sell like gold", this is quite true because of its status in benefiting the health of humans. Because of the various health benefits that the garlic is packed with, it has been the most cherished and sought-after additive used in most of the Indian recipes. It is also advisable for other countries in the world to follow this step in order to tap into the benefits of garlic. 2. It can be consumed as other supplements, like garlic extract and garlic oil. The garlic is known to fight against a lot number of diseases, it has been termed as a store-house of medical properties. It is very useful to our oral health, very low on calories and highly enriched in nutrients. So many people dislikes garlic because of its pungent smell, others are also allergic to it, but there is for sure a lot of benefits of eating garlic. If you fall among the group of those that detest it, maybe after going through the health benefits listed below you might have a second thought about including garlic in your meals and diets. The garlic is highly rich in minerals and vitamins. Such minerals and vitamins includes; manganese, selenium, vitamin B6, C and fibre and traces of potassium, iron, phosphorus, calcium, copper and vitamin B1. All these nutrients are essential for the human body. According to various studies, regular consumption of garlic is capable of boosting the immune system and cutting down cold and its related symptoms by almost 63%. A lot of antioxidants are also found in garlic, which fights against oxidative injuries in the system. Dieticians always advice people that are prone to falling sick, and those who always catch cold to include more garlic in their diets. There is a compound called polysulphide that is found in garlic. The red blood cells converts these compounds to hydrogen sulphide, which helps in dilating the blood vessels and eventually assist in lowering the blood pressure. Including garlic in your diet or eating it raw can help in checkmating the blood pressure. Regular consumption of garlic controls the weight by cutting down the fat stores. Garlic also suppresses our appetite by stimulating the satiety centre in the brain with its strong smell. There is compound called Ajoene that is found in garlic. Ajoene possesses anti-clotting properties that aids in preventing blood clots. The regular inclusion of garlic into our diet may prevent blood clotting and keep one safe from the risk of clotting post surgeries and cardiovascular diseases. The regular inclusion of garlic in your diet helps to maintain the elasticity of your arteries, it also fight the free radicals and protect the heart against them. Ajoene found in garlic has anti-clotting properties that help in preventing blood clots. Polysulphides found in garlic help in dilating the blood vessels. All of these together achieve the purpose of keeping your heart healthy. Allicin is another compound that is found in garlic. Allicin helps in moderating the levels of triglycerides found in the blood, eventually bringing down the level of total cholesterol in the body. 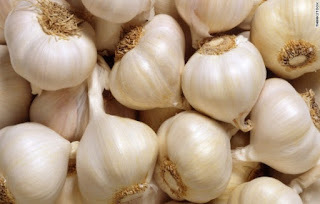 Diallyl sulphides present in garlic improves iron metabolism by increasing the production of ferroportin, which helps in the absorption and release of iron. Hence garlic keeps a check on anaemia and fulfils your iron deficiency. In summary, since you have discovered some of the health benefits derived in eating garlic, it is better to keep the issue with the smell aside and include this food in your diet. If you find thus post informative, please kindly share using the various share button icons below. You might be spreading it to someone who really needs it. Adelaide most people hate the smell, but apart from that it is quite healthy for you.